one person. one architect. onesmallproject. repeat. Eleven artists/architects contributed flatworks -- drawings, paintings, or photographs -- to the "small architecture BIG LANDSCAPES" show at the Swope Art Museum. Artists from Argentina, Canada, Germany, Slovenia, Spain, and the U.S. considered subject matter in their home countries, and in Brazil, China, Kenya, Venezuela, and the West Bank. In so doing, they brought an international awareness to the show's content, highlighting that some issues and strategies are somewhat consistent globally, even as local pressures and potentials bring distinctiveness to the small architecture and big landscapes that are being created every day and every second around the world. Marjetica Potrc works closely with local communities to devise homegrown, sustainable solutions to the daily quality-of-life dilemmas that affect people who live in the world's city slums. 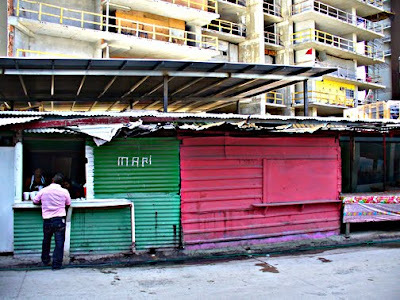 As part of a process she calls "participatory design," Potrc has spent months immersed in places such as settlements in the Western Balkans and the barrios of Caracas, Venezuela, engaging the knowledge of local people and drawing from existing materials to create designs to improve their living conditions. 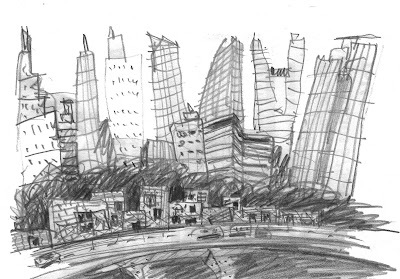 Her work is driven by her belief that, "Citizens are the ones who make the city." Potrc has had solo exhibitions at the Guggenheim Museum and Max Protech Gallery (New York), Nordenhake Gallery (Berlin), the List Visual Arts Center at MIT, and the De Appel Foundation in Amsterdam. Her installation "Genesis" is on permanent display at the Nobel Peace Center in Oslo, Norway. The project "Insect-House: The Tick's Stratagem" came about when Alameda Viva invited Cirugeda to support their act of resistance to the cutting down of trees in Seville by occupying those same trees. By following the fundamental premises of the efficacious urban guerrilla, the activist-architect designed shelters that allowed for immediate construction. The outside shell protected occupants from possible aggressors. The shelter's bottom was usually 4.5 meters off the ground and provided storage space; the top had a sliding shell for protection. The implicit goal was remind people that even if their voice is considerably quieted, they still can act and decide. They have a say. Beyond a mere ecological attitude concerning the protection of trees, this is a strategy of opposition to plans directed, and often imposed, on the population and its style of urban life. As an architect, I witness a side of real estate development and consumer culture that many people never see. Developers and bankers have a language all their won, referring to buildings as "product" and "vehicles for profit." I came to the realization that most of what is built around us today is really not for our use or enjoyment, not to better our lives, but simply to wrangle a dollar from out pockets or to feed a proforma. This change how I fundamentally think about making buildings and pictures. Begun in early 2008, Economic Entropy is a visual documentation of change in the American built environment caused by short sighted economic methods. Economic Entropy is a depiction of randomness and inevitable deterioration in a social system caused by economic change. It is nature and the objects of consumerism together reaching a state of inert uniformity. Dumpsters exist in everyday environments, alongside each of us. I find beauty and potential existing within this subject, typically understood to be leftover, ugly, or rubbish -- sometimes relegated to the back lot, out of the way, sometimes right under our noses in plain sight. Always, like dutiful soldiers, continually collecting more and more waste. We take them for granted, but they are always there as a part of our landscape. The Dumpster as subject was "discovered" by looking for simple colorist subject matter as a challenge for an unattractive setting and then portraying it to illustrate the beauty within that subject, through light and shadow. These paintings are among those selected from "Sites Unseen," an artistic collaboration between artist Alan Frakes and the photography of Wes Janz, and address the impression the common everyday dumpster has made on the landscape. Prefabricated houses roll south, 70 miles per hour, on I-69. I daydream north, 13+ years, same speed, same road, from my Indianapolis home to Ball State University. The prefabs are sourced in northern Indiana, in Elhart--the "RV Capital of the World," Middlebury, and places with fun names: Goshen, Wakarusa, Nappanee, Shipshewana. The photos are inspired by Chris Jones' "chance processes" and John Cage's 4'33" composition. A house approaches, camera up, shutter plush, gone. Three seconds. Converging high speeds, closeness, and one-eye-on-prefab-one-eye-on-traffic bring blurs and out-of-frame experiences. Houses are backgrounded as overpasses, yellow lines, guardrails, vehicles, dirty windows, weather, seasonal landscapes, and signage come into view. January to July 2009. Prefabricated houses keep rolling, their mobility reflecting our confidence in the best of times, tagging along now with the contradictory and complementary forces of foreclosing, vacating, and on-the-moving in our unsettling and resettling lives. Throughout the Rust Belt, many thousands of long-vacant structures sit alone, boarded up. Indianapolis is a leading contributor with approximately 10,000 abandoned houses. This proposal explored the potential of the "gone" architectural stock of West Indianapolis. Talking with a local resident led the author to a "turnkey moment ... I came into the conversation with Antoine influenced by my preconceptions about urban decay ... but left with a memorable personal connection that went far beyond any purely academic concern. As a result, I recast my design knowledge first as a 'person' and then as an 'architect.'" Four hierarchical and interdependent approached were proposed. "Transfer" anticipates 100% material reuse. 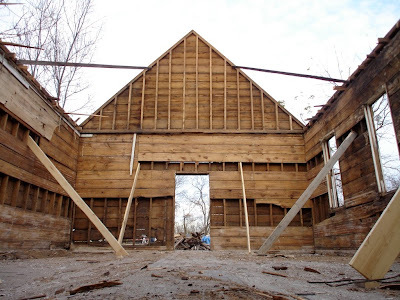 "Soft Demolition" reuses raw wood framing for small pavilions. "Band-aid" rehabilitates parts of houses thought the use of new enclosure systems, and "Architectural Transfer" introduces a "plug-n-stay" manufactured kit to revive abandoned houses. "9/11 Corner" (digital stitched portrait). Moose and Suzi Fitch changed the landscape of their inner city Flint neighborhood by purchasing vacant lots and transforming them into patriotic memorials. They've often said that someone has to remember the sacrifices made to secure our freedom. "Sense of Community: Mr. Smith." One in a series of 175 images and stories from a weekly photocolumn by Jessmore, published between 2004-2008, when he was the chief photographer for the Flint Journal. The series recognized Flint citizens who had not lost hope and vision that Flint could become a better place to live and work. The column received numerous state and national photojournalism awards. "150 Steps--A Walk Through Flint on Its Sesquicentennial" (2005-2006). Hi-resolution digital images manually stitched together document Flint streets in the city's 150th year. In all, 21 miles of city blocks were photographed. Saginaw Street and Third Avenue are shown. "Portraits from Above - Hong Kong's Informal Rooftop Communities"
Self-built settlements on the roofs of high-rise buildings have been an integral part of Hong Kong's history for over half a century. Rooftop structures range from basic shelters for the disadvantaged to intricate multi-storey constructions equipped with the amenities of modern life. Rufina Wu (Canada) and Stefan Canham (Germany) utilize the tools of an architect and the tools of a photographer to document rooftop communities on five buildings located in older districts in the Kowloon Peninsula, slated for redevelopment by the Urban Renewal Authority of Hong Kong. Text records of the residents' stories, measured drawings of each distinct rooftop structure, and high-resolution images of the domestic interiors of more than twenty households offer an unprecedented insight into the everyday life on Hong Kong's rooftops. (Their recently published book on the subject can be found @ Portraits from Above. Kounkuey Design Initiative practices architecture, landscape architecture, and urban planning in areas where environmental degradation compromises quality of life. Kibera, the largest informal settlement in Sub-Saharan Africa, is home to over 1,000,000 million residents, yet it has no trash collection system or formal dumping site and only 1 toilet per 250 people. Robert Neuwirth writes in Shadow Cities: A Billion Squatters, A New Urban World: "Some part of Kibera ... are so unsafe that you cannot walk from your hut to the latrine at night for fear of being mugged. So you either hold it until morning, or you use what Kenyans artfully but uncomfortably call 'flying toilets'--you use a plastic bag and then, after sunrise, you fling it as far from your home as you can." KDI designed a poster campaign to engage people throughout Nairobi in understanding the need for proper waste facilities in Kibera. Richard Saxton is an artist working in the fields of sculpture, architecture, design, and public art. The work presented here, Research Archive (Selected Pictures), is part of an ongoing investigation by Saxton into the construction of the built landscape. Serving a larger purpose of informing Saxton's other creative endeavors, the archive also exists as a work in itself, an accumulation of pictures that looks beyond the obvious, showing how disparate perspectives can inform interrelated but different spaces. The images come from a number of locales from across the world, including the Great Plains and Mountain West regions of the U.S., Europe, Haiti, and South America. Saxton's Research Archive primarily focuses on rural and owner-built structures, constructions that do not conform to any design standards or building codes. The archive is a celebration of freedom and autonomy in building, and is a testament to chance, resourcefulness, simplicity, unpredictability, and everyday ingenuity. "Slum 31 -- Interpretations / Observations"
Following the Friday, February 5 2010 opening reception of "small architecture BIG LANDSCAPES," a roundtable discussion was held the afternoon of Saturday, February 6. Titled "small group of architects BIG PUBLIC DISCUSSION," the session was moderated by Wes Janz, with smallBIG contributors Azin Valy, Bryan Finoki, David Stairs, Giulia Fiocca, Olon Dotson, and Scott Shall asked to take leading roles in setting out questions or responses to the larger group. Persons from the local community also participated in the roundtable, held in a permanent gallery room of the Swope Art Museum. It is important "to build relationships, rather than to build," and to be involved in ways that cause us not to be the tools of developers. People "survive without us." Think: "small action BIG REINVENTION." "Who are we to try to depict" the lives of those living in distress? The architect should function in "strictly an assist role, maybe as a translator." Remember: "humanity persists despite struggle." It's important to shift curiosities from "What are we doing?" to "Are we doing any good at all?" His interest is not in the "cult" of the architects, but in the profession of architecture. Here, "Ivan Illich has discused professions as self-aggrandizing." David does not use the word "intervention," which is popular with architects. The "wisdom on the ground" should be the "first precept." Get involved on a "first name basis." For more on Illich, see David's article "POSTprofessional" at Design-Altruism-Project. For more on "first name basis," see Janz's postings (Part 1 and Part 2) at Design-Altruism-Project. "When the word 'intervention' is used, it's not neutral." He prefers "injection," is in "going with the flow." Sees the "built environment as an enforcer of behavior." "Who do we define spatial justice? ... Is there ethical space? ... How do we practice spatial justice? ... What is spatial injustice?" "We can't go anywhere without money being involved." We need to be concerned with "civility," with "staying involved... People have forgotten how to participate in spatial justice." "Ownership factors into it... What is owned in private? What is owned by the public?" We can speak of "owners and non-owners." "Can space liberate?" "Foucalt said: space can liberate if occupants and designers are in alignment." "Are we much better at creating oppressive space?" "Architecture liberates power and capital. Not people." "Sharing information can liberate people and bring about collaboration and cross-pollination." "The internet has made us lazy... We're not getting out to make public space." "Do we knock on doors or do we come in through the door?" "The information age is changing things rapidly... Tomorrow we'll have to be reparameterized." "How long do you have to be in a place to know what is justice?" There is a "complete assault on our lives." This "small architecture BIG LANDSCAPES" show argues for a "return to our own empowerment at a rudimentary level." Is the architect a "facilitator of people's processes?" "Who are these people? How much can we share with them?" "Justice is something that's bred in the bone. "We exult in the freedom of the internet at our peril." "Most of the people in the world communicate face-to-face. 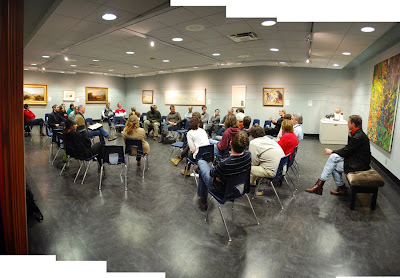 We must see human interaction as a face-to-face activity." "Can you give an example of spatial injustice?" "Yes. The houses 'given' to people on reservations. The way they are just dropped off, the low quality of the dwelling to begin with." When teaching at the Rosebud Indian Reservation in South Dakota, she saw "people come to school and wear the same sweatshirt every day." "You're underwater and that's not questioned." The "architecture of 'the projects' is the same as the architecture of prisons." "Where did the word 'projects' come from?" What is the root cause of the problems? ... It's so easy to blame poverty, or capitalism, or justice." It's important to see "words not as absolutes, but as gray." See the "Clip House" by Interloop Architecture in Houston. "All too often, the spaces are more menacing than the people." See the thematic for the 2010 Venice Biennale, "People Meet in Architecture." "We are embodied by discipline and law... (We) feel the immediate realities." "Are there models of good works? ... I'm sitting here as a citizen, not as an architect... Architects are seen as the servants of the rich... Are there any good alternative examples? Can we find models that give us a sense of how to move forward?" "I don't like and I don't want models. I like this idea of one small project with big impact. How does one module provide a beginning point?" (referring to the smallBIG show) "This is it ... this is next ... this is it... This is a fledgling field of sorts." Community development organizations, like LISC (Local Initiative Support Corporation), people with "a heart for the development of communities." See the book, "The Starfish and the Spider." Spiders are centralized -- cut off a leg and you have a seven-legged spider, crush the head and you have a dead spider. Spider organizations are centralized, structured. Everyone knows the identity of the boss. Starfish are decentralized -- not only can they grow new limbs, they can regrow their body from a part of a severed limb. Every limb has everything it needs to fully exist. Starfish are organized not around hierarchy or structure, but around ideas and shared principles. The internet supports starfish, like Napster which was forced to refine and re-up itself after some of its essential identity severed. "The future will be designed collaboratively... The group brain is more effective than the singular brain." Three small constructions were made specifically for the "smallBIG" show at the Swope. Two of the installations -- one by Janice Shimizu and Josh Coggeshall, the other by Ana de Brea -- became pieces of furniture, an in-between scale in-keeping with the human body and en-couraging touching, interacting, feeling the piece, and the body. Each of these pieces repurposed salvaged materials -- for Janice and Josh, timbers found alongside a street in Muncie, leftover from a demolished industrial building, then thrown in the back of Josh's truck; in Ana's case, plastic bags, plastic bags, plastic bags, plastic bags, plastic bags (i.e., she used a lot of plastic bags). The third, by Roberto Frangella, has its own brilliance -- brought from Buenos Aires (where Frangella lives) when de Brea returned from her holiday visit home, the "house" is made simply, of six painted stiff pieces of paper held together with an array of bulldog clips. Simple, beautiful, handmade, inexpensive ... as much as any piece, Frangella's "El Habitat Minimo" captures the spirit explored and dimensionalized in "small architecture BIG LANDSCAPES." "Art helps reflect on real situations of life. I pay attention to the way many people live in the suburbs of the province of Buenos Aires. I imagine people leaving their homes in the morning and walking unpaved roads crossing abandoned sites, seeing small houses always under construction, a precarious football field, water coming from a hole, seeing that old cart horse, a few people riding bikes, the street dogs. All that happening during very hot summers or very cold winters. It is a life of effort and sacrifice that many people live in order to give their children a future. In our poorest neighborhoods, the bravest people are found, those whose lives yield an example of perseverance and continuous work. These people are the focus of my art, the heroes of my illusions. Through my drawings they are the most important men and women of Argentina. At least for just this time." "Urban tree removal becomes necessary when a previous asset becomes a liability, but it is an unnecessary expense. While municipalities face an increasing demand for tree removal, rising labor and transportation costs, landfill fees, and lost opportunity costs (money not spend elsewhere), there is an alternative to this financial and environmental burden. With managed stewardship, cost recovery could be achieved by harvesting trees while they have value. By maintaining an arboreal diversity that preserves street aesthetic and function yet responds to the possible future uses, new infrastructure could supply a flexible demand for this resource. What started as an idea about recycling street trees has transformed into a larger vision of the inter-connected management of urban forests. We liken a cabinet built from salvaged timber to a new quilt made from small and varied pieces: an aesthetic that celebrates what might come our way and transforms a liability back into an asset." Essays were written specifically for the small architecture BIG LANDSCAPES show at the Swope Art Museum. They are collected, for now, at the onesmallproject.issuu site. "Small and Beautiful Aren't Always Compatible, but Nearly Always"
"The Past, Present, and Future of a Shrinking City"
"Unsettling Settlement: Walking Though a Low-Income Neighborhood in Shanghai"
An expanded catalog of the show is in production and will include these writings, and more. 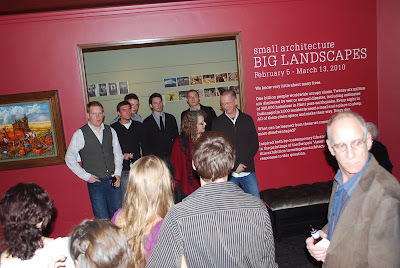 The opening reception of the "small architecture BIG LANDSCAPES" show at the Swope Art Museum was held on Friday, February 5, 2010. I'm posting images from some of the evening's events, THANKING my great friends and colleagues who were in attendance (fighting through an 8" snowstorm) and those who were not, hoping we can do it again ... soon. Lisa Petrulis (center) introduces Wes Janz. Students from Southern Illinois University stand in the background, at the entry portal to the Tool Room. 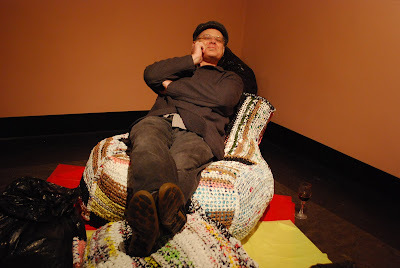 Kevin Klinger (architecture professor, Ball State University) takes it in, reclined in a chair designed and fabricated by Ana de Brea (architecture professor, BSU). The chair is made of 100% repurposed plastic. 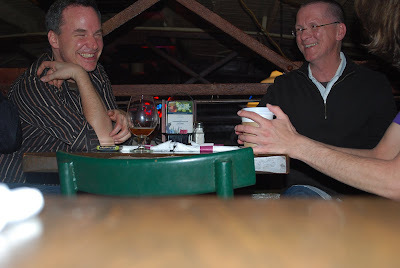 On the left, Craig McCormick, architect, photographer, and contributor of two photographs to the Swope Show. 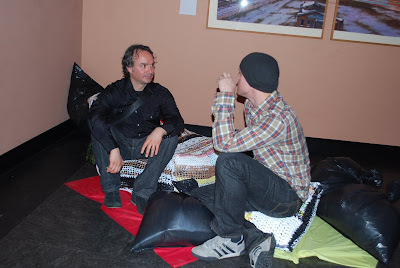 In conversation with Craig is Kurt West, designer of graphic materials for the show. 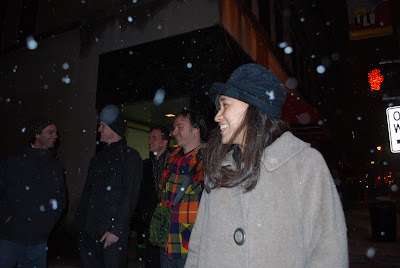 From left, Bryan Finoki (subtopia blogger and Swope Show essayist), Kurt West, Paul Puzzello (architecture professor, BSU), Craig McCormick, and Janice Shimizu (co-creator of the "W.H.U.T." small construction; architecture professor, BSU), on our way to dinner after the reception's closing. Some of the "group of 36 diners" waiting for our tables, in a restaurant emptied, except for us, by the snowstorm. At dinner. In background, Shai Yeshayahu (architecture professor, SIU; co-creator "Walk On" small architecture installation), Azin Valy (architect, I-Beam Design; creator "Green Springs" small architecture installation); Kevin Klinger, and Wil Marquez. Center foreground, Maria del C. Vera (architecture professor, SIU; co-creator "Walk On" small architecture installation). Paul Puzzello and Wes Janz. Yes, workers and materials are essential. But to a great extent, the built environment is shaped by what we carry in our toolboxes. To explore this point within the context of the small architecture BIG LANDSCAPES show, architects, architecture professors, and graduate students in cities around the world talked with local self-builders about: their work, the buildings that they had under construction, and their tools. 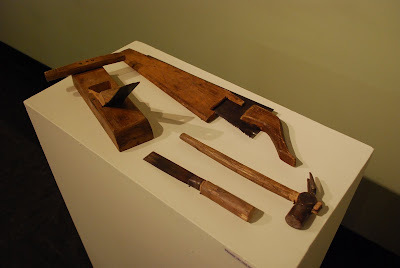 Many similarities exist among the tools that were connected and are on display. Hammers, saws, strings, and plumb bobs are recognizable; it seems everyone pounds, cuts, and aligns. There also are differences caused by local economics, available building materials, and long held construction practices. Note the "stone chiseler" from Nepal, the nail puller from Canada, and the wooden trowels from Panama. That said, unique qualities do exist for the same type of implement. See the distinctiveness of the Thai hammer, the pipe-handle-welded-to-hammerhead from Honduras, and the "adze" hammer from Turkey. After seeing these tools, one can better understand: they are found in the toolboxes of some of the most determined, prolific, and talented builders in the world. Gaurab is an architect working on a school hostel and support building near the rural village of Samagaon, Nepal. The project's base camp is located on Mount Manaslu, a town inhabited by people of Tibetan origin, located in the Budhi Gandaki valley of the Nepal Himalayas. Manaslu, also known as Kutang, is the eighth highest mountain in the world. The buildings' design is influenced by local architectural styles and construction techniques, along with both a monastery style and a contemporary style found in educational facilities. Locally sourced stone and wood are featured, with corrugated sheets brought in by helicopter. Note that the construction workers build temporary shelters for themselves on-site from the the materials that will be used to construct the permanent buildings. Despite their hardened faces, worn and battered edges, and their embossed character, these tools--forged from steel and wood--have left a sensitive, yet indelible mark on a community of seventy people in rural Canada. For the past two years, students in the School of Architecture at the University of Manitoba collaborated with the town of Clearwater to deconstruct abandoned structures, left in the wake of industrial agricultural practices, into new stockpiles of century-old virgin lumber ready for reuse. The students worked with this community in order to develop unique architectural responses to the town and surrounding landscape. In addition, the students used the reclaimed wood to build their own designs. These tools, like those that handled them, have been transformed by their experience as instruments of teaching as much as they've been instruments of un/re-building. Huseyin Koseoglu, 63, is a self-builder in Cedit, one of the oldest informal settlements in Izmit, Turkey. Before retirement, he labored as a construction worker in the formal economy. These days, he is finishing the ground floor of his family's house, a project started fifteen years ago. Koseoglu employes hand tools purchased at a local hardware store. An adze, the most common tool of self-builders, is used in all stages of construction. A trowel, shovel, and sand sifter prepare mortar. Plumbs, rulers, and strings establish guidelines. Building materials also are found locally. Reclaimed doors and windows initially are installed; later they are replaced with new ones. 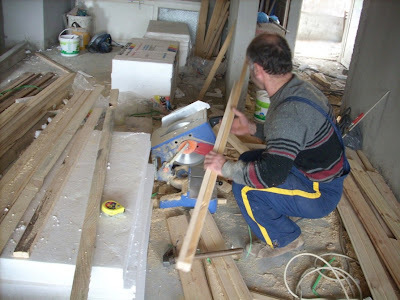 According to Kodeoglu, after a destructive earthquake in 1999 killed tens of thousands, self-builders are more aware of construction codes and the proper use of structural reinforcement, and the municipality requires the use of ready-mixed concrete and is more active in controlling construction. In 1980, at age fifteen, Samorano Diaz moved from his rural home to Panama City in search of work. He started as a "peon," the lowest constructor position. 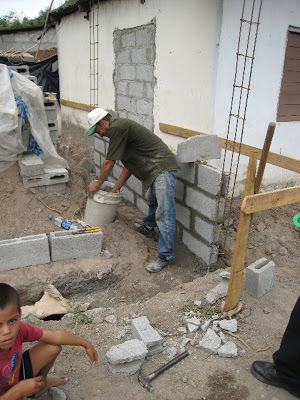 Today, Diaz has two jobs: as a "capataz" (the highest builder role) he constructs for the elite during the day; on weekends and evenings he builds for neighbors in Valle de Urraca, a planned settlement for some of Panama City's poorest residents. Because Valle de Urraca residents cannot afford to build a house all at once, Diaz begins and then comes back to finish once the owner has acquired the necessary material and funds. His formal job pays $800 per month; he earns an extra $500 a month by building for neighbors. 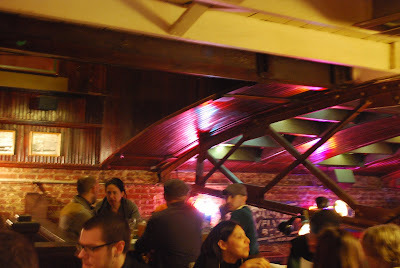 Diaz also built many of the temporary "lunching" structures shown in the photographs. In the north of Thailand, the Pra Non Community in Phrae resides in the old city wall. 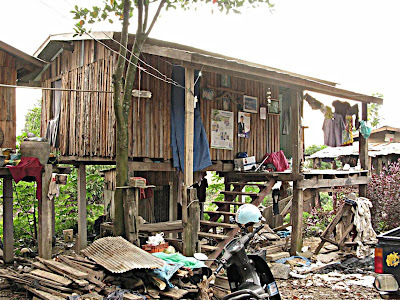 There, illegal houses are built using scavenged materials. Corrugated sheets are everywhere: as formwork for concrete columns, and as walls and roofs. As stated by Chamnarn, "the result is both a beautiful texture and a prime example of the technique of applying a building material as a tool." Another illegal community in Phrae is behind the bus terminal. Many of its residents work as garbage collectors and servants in the city; there are few skilled laborers among them. This settlement is supported by the Community Organization Development Institute; together, the residents and institute fight for the people's right to own land. Each household, after applying to CODI, will receive a $600 loan to fix or rebuild their house. "We talked to a crew building a concrete house. They had on site 2 short levels, a hammer, a 16' tape measure, a plumb, several spades, a tool for digging holes (not a post hole digger, but a flat piece of metal, slightly flared at the bottom, about 6 inches at the widest part, attached to a wood handle), a rusty hand saw, sting, wood for stakes, a couple of triangle trowels and buckets for mortar, and a screen for sifting the sand (home made). They 'cut' the block by smashing it with a hammer. This makes a very uneven end. A power saw to cut the wood is too expensive. No brick saw or even brick chisels. They do have access to power, but no power tools. They told me that they just buy their stuff in town at the hardware store." 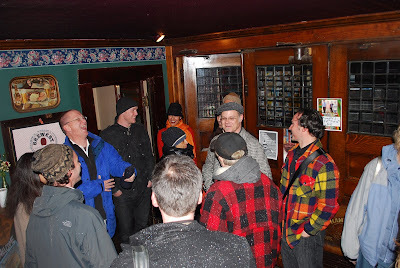 The "small architecture BIG LANDSCAPES" show, as curated by Wes Janz (founder of onesmallproject), opened Friday evening, February 5, in the midst of an 8" snowstorm in Terre Haute, Indiana. Many of the contributing architects, artists, and students were in attendance, including persons from Rome, Italy; New York, San Francisco, Philadelphia, Chicago, Mt. Pleasant, Michigan; Carbondale, Illinois, Indianapolis, and more. With this first posting, post-opening, the six "small architectures" are presented, along with the 150-word statements written by each of the creators or creating teams. In posts to follow, the smaller constructions, flatworks, and self-builder tool collections will be featured. 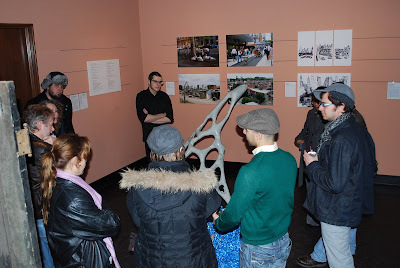 The photo above (of Wes Janz talking at the opening) and immediately below (of Southern Illinois students, with the "contributors' wall" in the background), along with several others in the post, are by Giulia Fiocca, an architect from Rome, Italy, where she is a member of Stalker/On, a group that helps persons living in areas where abandonment and impoverishment are common to develop better self-awareness of their community and the environment in order to enhance their involvement in the neighborhoods where they reside. Giulia came to Carbondale, Illinois to work with students organized by Southern Illinois University faculty members Maria Vera and Shai Yeshayahu on their "small architecture" installation for the smallBIG show. Go HERE for more of Giulia's photos from the opening. Over 40 million mattresses are discarded each year. By combining, Green Springs intends to help reduce landfill waste while decreasing greenhouse gases into the atmosphere. The Green Springs encourage the beautification of urban landscapes, using discarded bed springs to create green walls attached to existing building facades as free-standing screens or as horizontal trellises on green roofs. They reduce energy consumption by keeping the building cooler in the summer and greatly reducing the "heat island" effect. Used with planter boxes and mounted outside windows, the mattress springs serve as armatures for climbers to grow on without damaging the walls, generate a vegetated habitat with year-round color, and create a lush green space without encroaching on or using valuable land. By promoting their use in distressed urban neighborhoods, Green Springs would encourage the participation of residents in growing "facade gardens" from their own windows, reducing energy bills and creating a sense of pride. "Green Architecture: East St. Louis"
We have evidence of the U.S. position as the wealthiest and most powerful country on Earth, but have limited knowledge of its poverty and degradation. The distress and abandonment we find in the cores of Rust Belt cities, I term the "Fourth World" - Third World conditions in the First World. The causes of these deep declines are local even as they are shared: de-industrialization, historic discrimination patterns, suburban sprawl, tax base erosion, inability to embrace the concept of desegregation and civil rights legislation, fear, despair, crumbling infrastructure systems, disinvestment in schools, and environmental justice issues are widespread. Today, sustainability is at the forefront of many discourses. However, the value of "green" is inconsequential when sprawling development practices are dictated by such societal ills. This installation shapes a front porch, from which a "green" scene is viewed, in this case, downtown East St. Louis, one of many nearby cities whose remaining residents endure Fourth World conditions. Cartoneros, waste pickers, recyclers, binners, informal resource recoverers, or scavengers. During the Argentinian economic collapse in December 2001, many thousands of people in Buenos Aires suddenly found themselves living under the poverty line. Their new, yet skewed, identity as cartoneros has come to define an invisible cluster moving through the city collecting society's trash to trade, sell, and survive. They are countless, yet represent a culture whose value has gained attention and social acknowledgement. "Dialogue" translates the abstract into space and form. The conversations, contradictions, differences, and polarities that a group of people living together can offer has caused us to turn our attention to their value and purpose. Like the cartoneros, the authors believe there is no one-way of making, producing, creating, thinking, assembling, or constructing. In this exploration, they discovered that power is found in tolerance and in our ability to discover a future through process and understanding. "You see me | as | you are | not as | who I am"
How does one unveil a thread that reveals a nexus to our built world? This point of reference ignited our quest for a collective undertaking of capturing local details and indications of: changes, diversities, potentialities, thresholds, conflicts, and other less visible data. All which are often present amid our immediate landscape, yet undetected unless we intentionally seek means with which to document this reality. As we search out and experience the existing and dynamic complexities, our "collective findings" begin to amplify and depict a city's portrait filled with informational data that underscores the layers of multiple coexisting realities. When the RCA Dome was demolished to make way for the new Lucas Oil Stadium in downtown Indianapolis, over 225 tons of roofing material was salvaged from the structure and diverted from the landfill by People for Urban Progress, an Indianapolis-based, non-profit group which advances urban design initiatives through project-based urban interventions. This installation, completed by a group of fourth year architecture students from Ball State University under the guidance of Associate Professor Timothy Gray, is the beginning of a series of investigations intended to interrogate this material, to understand its potentials, and to eventually extend this understanding to creative re-use of the salvaged fabric. Using both conventional and digital methodologies, the panels represent an investigation into methods of joining and tensioning both the inner and outer shells of the old dome, and begin to explore the creative potentials of translucency and the play of light. A wood platform mounted at the center of the fabric screens invites one to inhabit the installation and suggests a dialogue between the movement of the panels and the movement of the body. The viewer is invited and encouraged to set the panels in motion with a gentle push. Participants: Timothy Gray, Austin Lucari, Jay Weeks, Brad Wanek, Veronica Eulacio, Eric Jensen, Mike Niezer, Paul Reynolds, Greg Hittler, Luke Haas, Mark Vanden Akker, and Ben Greenberg. FACT  _ Miles of CHAINLINK in the U.S.
fencePOCKET is an innovative, non-patented system designed to realize NEW PUBLIC SPACE by facilitating the OCCUPATION of our FENCESCAPE DEVIATIONS. _NO LEGAL HASSLES! Since every fencePOCKET is CUSTOM TAILORED, you never have to worry about TRESPASSING into either PLUBLIC or PRIVATE lands! _IMMENSE STRENGTH! fencePOCKET's UNIQUE WEAVE CONSTRUCTION allows even the smallest sections of RECLAIMED TARP to tap into the strength of exiting fences. Pick up your fencePOCKET today! Although supplies are endless, at these prices (free), unclaimed deviations are going fast!